DIN975 A2 Stainless Metric Threaded Rod is available from inventory in our Online Store from M5 to M24 diameter. All our stainless metric threaded rod come in 1mm lengths. 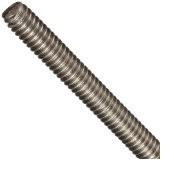 Currently not showing in our Online Store are DIN975 Steel RoHS compliant Zinc metric threaded rod as well as steel unthreaded rod, and steel square keystock. Contact us with a quick-quote for your inquiry not shown in our store.